Independent retailers all over the UK will be dishing up free organic mini breakfasts as part of their Wake Up To Organic events. The aim is to show how easy it is to switch to an organic breakfast, and to showcase the fabulous range of organic food and drink that your local independent stores and cafés offer. 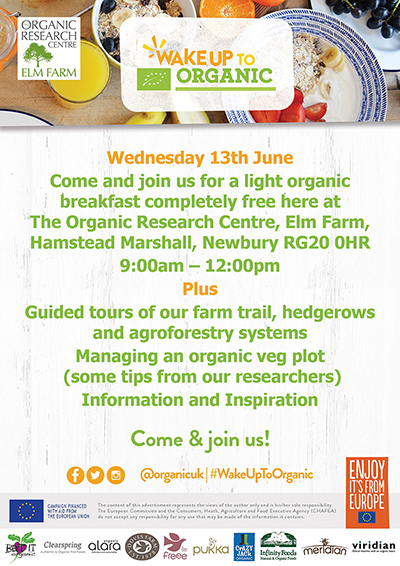 ORC will be hosting an event on 13th June, which aims to showcase some of the fascinating research that is carried out on the charity’s farm at Hamstead Marshall, which aims to develop ways to help organic farmers become more resilient and profitable whilst reducing their environmental impact. Researchers will be on hand to offer expert hints and tips on how to manage an organic veg plot as well as providing information on new research such as growing trees with crops, improving soil fertility, growing wildlife-friendly crops and the problems of dealing with pests and diseases in an organic crop rotation. We will be hosting a breakfast at Elm Farm from 9-12.30. Come and join us if you can!